Even if you dispute Mr. Hulot’s timeline – the IPCC recently said global carbon emissions would need to fall by 45 per cent below 2010 levels by 2030 to prevent planetary warming from exceeding 1.5 degrees Celsius – there is little scientific doubt about our current trajectory. Very few countries are on track to meet their greenhouse gas reduction targets under the 2015 Paris climate accord. And yet, Mr. Macron gives the impression of trying hard. It was the French President, after all, who vowed to “make the planet great again” after U.S. President Donald Trump announced his intention to pull out of the Paris accord. Mr. Macron has pledged to spend more than €70-billion ($110-billion) on renewable energy subsidies by 2028. And, starting on Jan. 1, his government is set to implement a carbon tax that will increase the per-litre price of diesel fuel used by most French motorists by 26 centimes (39 cents) by 2022. Yellow vests (Gilets jaunes) protestors shout slogans as material burns during a protest against rising oil prices and living costs near the Arc of Triomphe on the Champs Elysees in Paris, on Nov. 24, 2018. 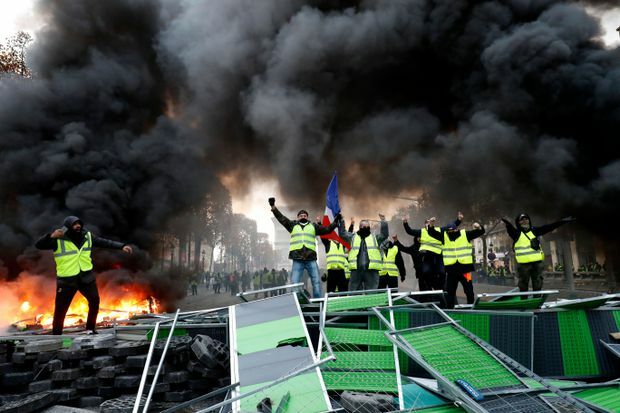 That latter plan has been thrown into limbo, however, by the massive protests of the gilets jaunes (yellow vests) – so-named for the security vest every French driver must by law keep in his or her glove compartment – that have destabilized Mr. Macron’s government in recent weeks. While the hyperactive French President expected to endure opposition to his labour reforms and overhaul of the state-owned railway – opposition he successfully neutralized – the revolt against his carbon tax caught Mr. Macron and the Paris-based media completely off-guard. And yet, this uprising by a feeling-forgotten French periphery against an elite epitomized by Ms. Binoche and company should have been entirely predictable. The gilets jaunes are rising up against what they see as an attack on their already difficult lifestyles. It’s easy for well-off elites to call for radical action to halt climate change, since such measures demand little of them. But for those who toil in factories that spew greenhouse gases and need their more cheaply priced diesel cars to get to work, Mr. Macron’s carbon taxes are a provocation. The message of the elites, as internalized by the gilets jaunes, is that they are engaged in immoral behaviours simply by virtue of their dependence on industrial jobs and their cars. The gilets jaunes argue they’re just trying to make an honest living. On Wednesday, Mr. Macron aimed to strike a compromise between the elites worried about “the end of the world” and the gilets jaunes just worried about “the end of the month.” While he stood firm on the first instalment of the fuel-tax increase set to take effect in 2019, he promised the carbon-tax increase in the following three years will be adjusted to take into account the market price of diesel gasoline. The compromise has failed to satisfy anyone. There are parallels between what is happening in France and almost every other developed country, including Canada, as comfortable urban elites seek to impose their climate change agenda on a broader population just struggling to pay its bills and earn an honest buck. No amount of hand-wringing over the fate of the planet, be it by the IPCC or by the likes of Ms. Binoche, is going to resonate with people who do not feel the elites have their interests at heart.